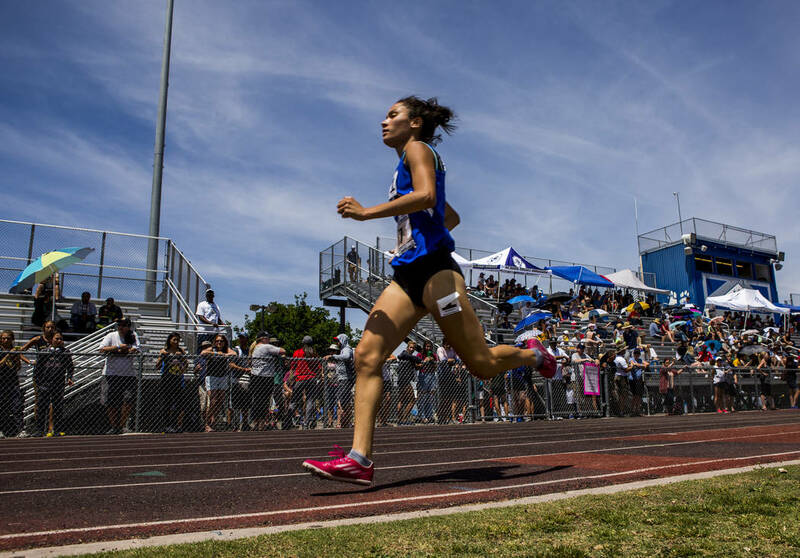 Basic’s Raquel Chavez won both distance races in the Sunrise Region track meet at Basic High School on Saturday morning. Basic junior Raquel Chavez was recruited by the school’s coaches to run cross country and track and field as a freshman after running a mile in 6 minutes, 30 seconds during gym class. She’s a lot faster now. Chavez posted the top time in the preliminaries of the 1,600-meter run on Saturday in the Sunrise Region meet at Basic High School on Saturday with a time of in 5:26.16. She also clinched a trip to the Class 4A state track meet by winning the 3,200 meter run — which completed its finals — in 11:41.05. 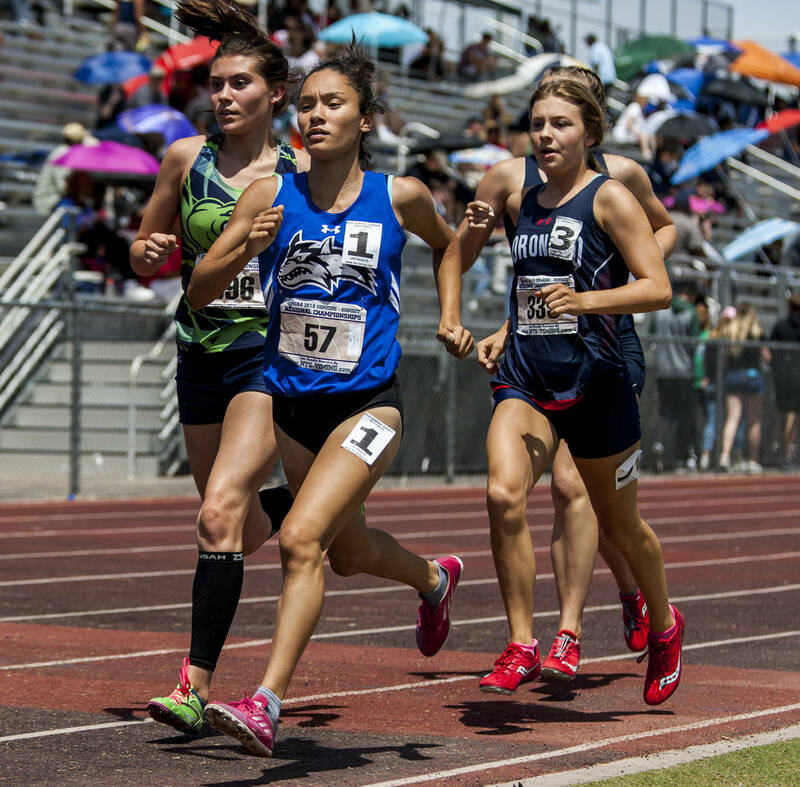 A two-time state qualifier and the fastest area distance runner this season, Chavez will look to cement her spot at state in the 1,600 meters in the region finals on Saturday, May 12. She says she still has room for improvement. 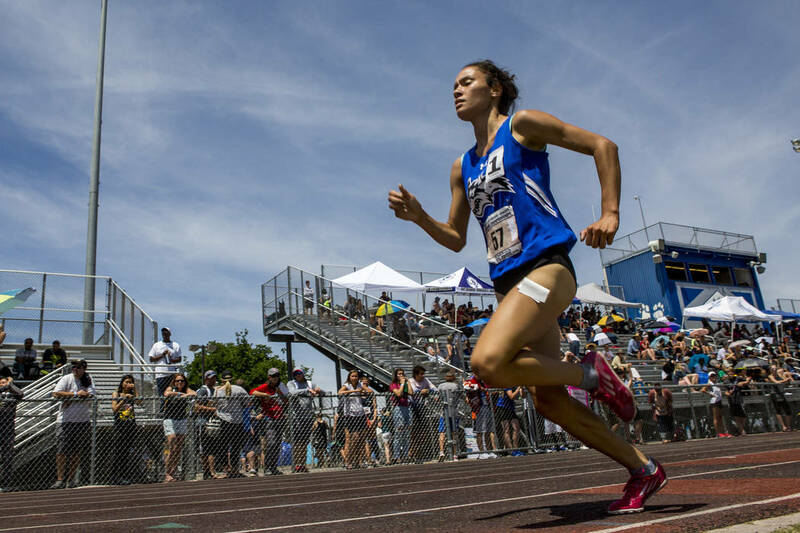 Chavez hadn’t ran competitively until her freshman year, and surprised her coaches by qualifying for state. She improved as a sophomore, reaching state again, and set the standard for Southern distances runners this season by logging the fastest times in the 1,600 and 3,200-meter runs so far. 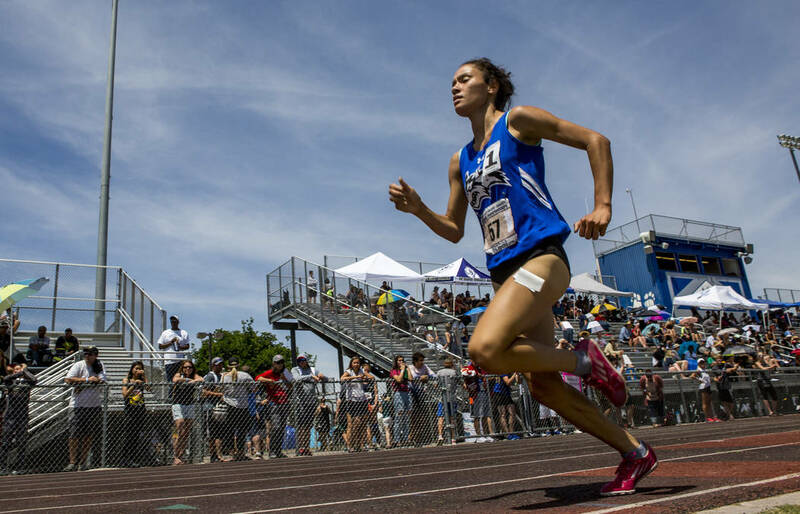 Chavez said she prefers the 3200-meter run because there’s more time to run a cerebral race. She’s comfortable running 1,600 meters, too, though, and cruised in both events on Saturday, winning by several meters. She’ll recoup this week — she said she never feels sore or fatigued — and prepare for the region championship race. Liberty’s Rae Burrell cleared 5 feet, 4 inches to clinch the region high jump championship. Eldorado’s Mohn’Ai’ Roberson had a mark of 18-5½ to win the region long jump title. Liberty’s Athiya Iese won the region championship in the discus with a throw of 120-5. Green Valley’s Izzy Madrid won the 100-meter hurdle prelims in 15.35, and teammate Jada Bell finished second in 15.78. Coronado’s Keaton Daniel clinched the region championship in the pole vault by clearing 15-5. Liberty’s Corey Moore Jr. won the region championship in the shot put with a throw of 52-8½ inches. Las Vegas High’s Marlon Harrison won the region championship in the triple jump with a distance of 44-1. Silverado’s Omar Aguilar-Espinoza won the 3,200 in 9:38.88 to win the region championship. Isaiah Hayden of Canyon Springs won the 100-meter preliminary race in 10.88. Liberty’s 400-meter relay team posted a personal-record of 42.99 en route to first place in the preliminaries.